The Fundamentals of the Securities Industry provides an overview of the principle financial products, how they are created, and how they are traded. The book is a primer on stocks, bonds, and options designed for those relatively new to the financial services industry. This accessible and easy-to-read book explores each subject with just enough detail to give the reader a general knowledge of the area, enough knowledge to function as the foundation for more detailed and indepth study in the future. The book is intended to be read in its entirety and in order. The concepts presented in the book build on each other, building comprehension and gaining a fuller understanding of how the securities industry works and is interconnected. The author touches on all of Wall Street's buzz words, explaining what they really mean and why they are important: margin call, earnings per share, yield to maturity, accrued interest, short sale, put and call, and others. The author covers every major financial instrument and provides the key basics of each, including: Common stock, rights and warrants, and preferred stock; Corporate bonds, municipal bonds, and government securities; The machinations of interest; Options as a hedging tool; The primary and secondary markets; Types of orders; Analysis of securities; In addition, The Fundamentals of the Securities Industry includes quizzes, exercises, and case studies that test the reader's comprehension. The author provides detailed explanations of the correct answers. The book is based on The Basics of Stocks, Bonds, and Options, a self-published book that is used at NYIF. 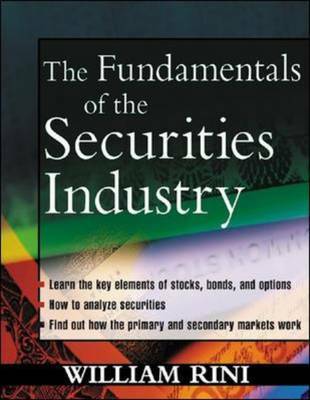 The Fundamentals of the Securities Industry is an extremely reader friendly book and should be the very first book to read for those interested in the financial industry and how it works.